Although this looks like a delicate plant Campanula rotundifolia is remarkably hardy and drought tolerant. Attractive blue flowers, good green foliage and a real no fuss plant. It is a plant that has lax stems and can fall over a little in wet weather, however we find it to be an attractive and long flowering addition to the cottage garden. A tough drought tolerant perennial Campanula rotundifolia is also known as the ‘Scottish Harebell’. Two forms are available, the blue flowering variety and a white form Campanula rotundifolia alba. Not widely seen in nurseries in Australia, however you can often pick them up at rare plant fairs. The flowers are small, however they do appear in masses from early spring through summer through to autumn. In flower the plant will reach around 50cm in height, foliage is a nice green, and this really is a great little plant for the front of the border. For a little plant that is really an alpine this one is tough. In our garden Campanula rotundifolia has flowered well through the summer. It coped well with a series of 40°C days and no real rain for weeks. We have declared it drought tolerant. 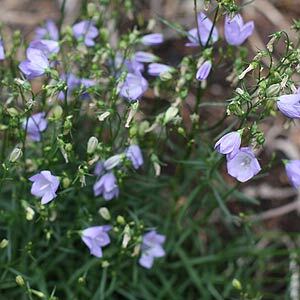 Give it a little seaweed fertilizer and bit of a trim to keep it in shape and Campanula rotundifolia will reward you with pretty little flowers and trouble free gardening for many years. Easy from root cuttings taken in early spring. Also possible from seed although they will take 2 – 3 years to reach flowering size.